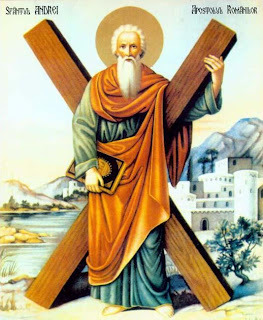 O Glorious St. Andrew, you were the first to recognize and follow the Lamb of God. With your friend St. John you remained with Jesus for that first day, for your entire life, and now throughout eternity. As you led your brother St. Peter to Christ and many others after him, draw us also to him. Teach us to lead others to Christ solely out of love for him and dedication in his service. Help us to learn the lesson of the Cross and to carry our daily crosses without complaint so that they may carry us to Jesus.